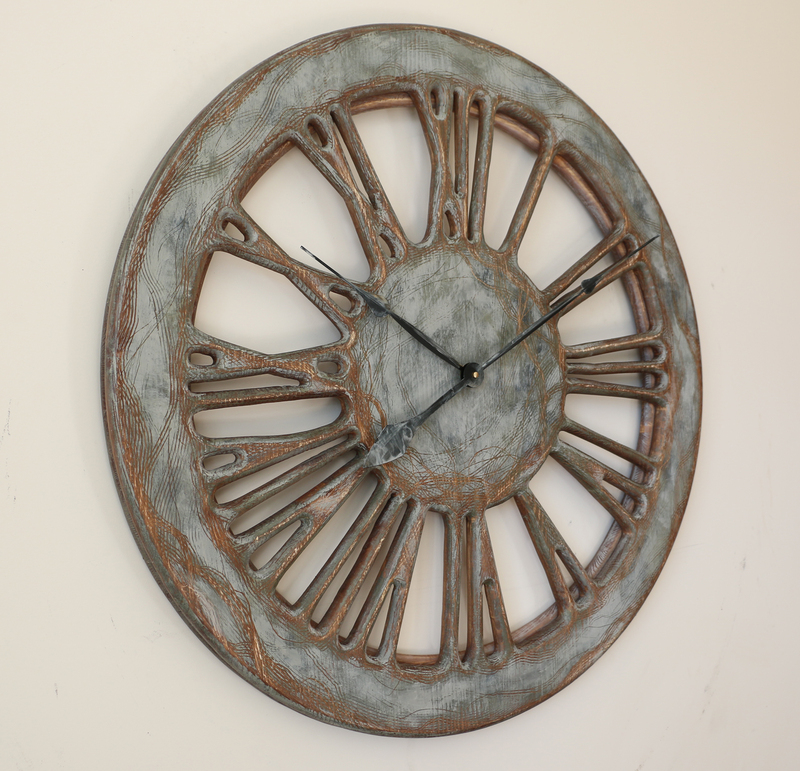 Many massive wall clocks that you can find online look very similar with their metal frame and heavy look. 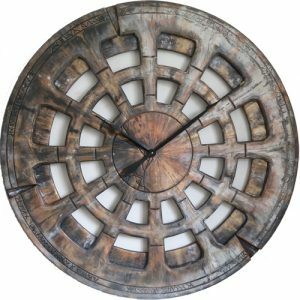 On the other hand any extra large wall clock from Peak Art shows unique character. 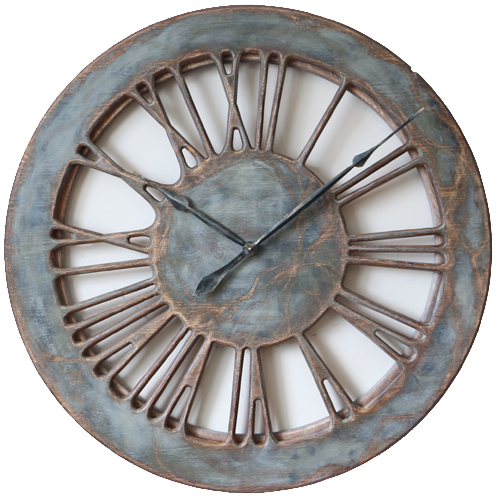 Our “Rustic Grey” is just an example of the most stunning timepiece to decorate your living space. 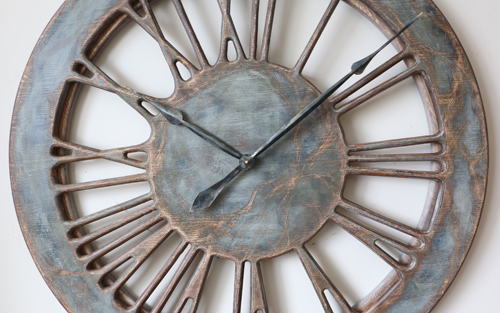 The face is cut out of a single large panel of pine wood and shows large roman numerals. 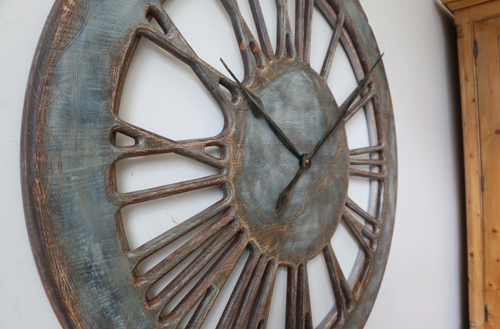 We have attached an additional narrow rim at the back to expose the three dimensional look. 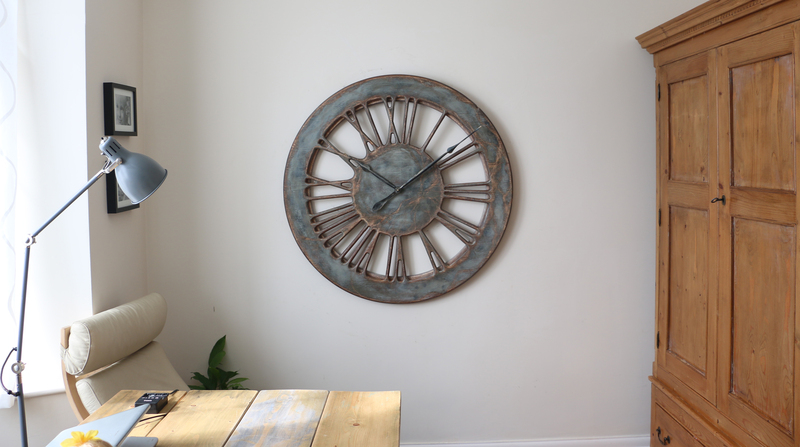 While you maybe looking for an extra large wall clock, we offer three different sizes. 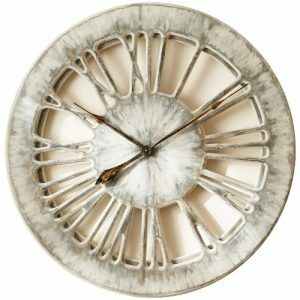 Most timepieces from our collection are made to order so don’t expect any two wall clocks to be the identical. Handmade nature adds character and uniqueness to each design. 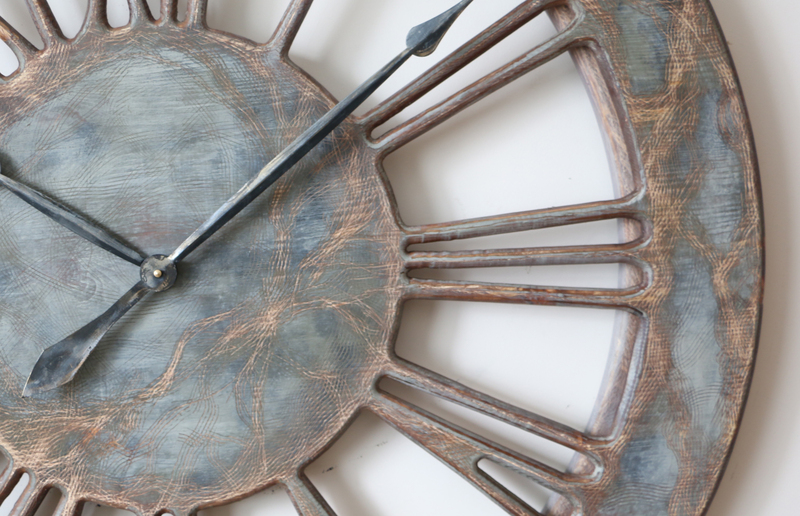 I never get bored with making those stunning three dimensional skeleton clocks. They have so much character and make such a strong impression! It is sheer joy to see how each of them unfolds as I design, cut and paint them. It doesn’t always work exactly how I plan it. Is that the problem? I don’t think so because following the plan is great but the main point is uniqueness, isn’t it? 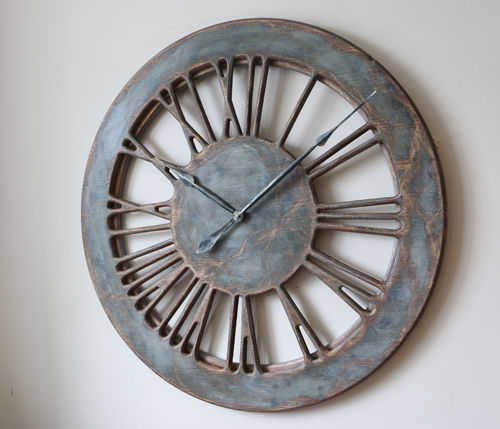 This particular extra large wall clock have been a bit of an experiment from the start. I wanted to make the face looking grey but also distressed and interesting. Although I struggled to begin with I think I have achieved this rustic look I was hoping for. 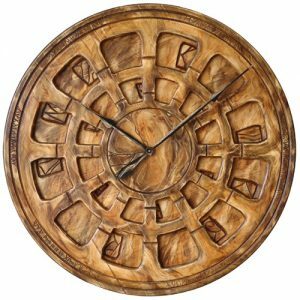 Every single clock from Peak Art has its unique features and distinctive nature. This is what differentiates those handmade pieces of art from the mass produced cheap alternatives. People are looking for something special to decorate their kitchens, bedrooms or hallways in a stylish way with a bit of a “wow” factor. That is the reason Peak Art was born – to deliver remarkable visual effect with functional wall art. 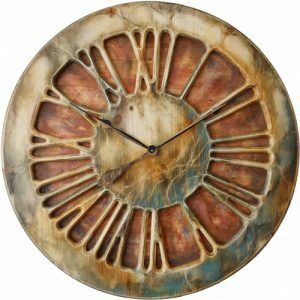 Please visit our blog section if you want to find a bit more about Skeleton Wall Clocks from Peak Art. This blog shows you the difference between our handmade products and the “alternatives” made in factories. There are thousands of people in our Facebook Community so join them to share your views and comments. 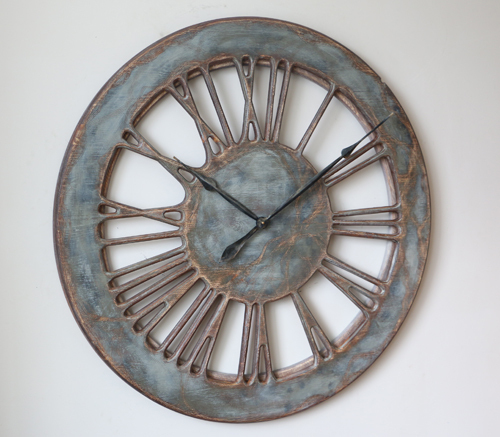 Please let me know what you think about this timepiece as the modern alternative to large paintings and mirrors? Would you rather follow the old trends in interior design or be part of something new? 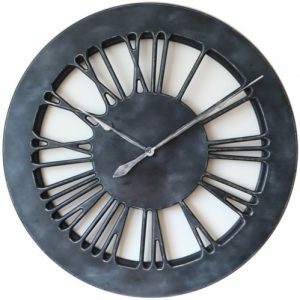 How about working with me to design your own colour scheme and truly custom extra large wall clock design?